Birds fly over the rainbow. Why, then, oh, why can't I? Beyond the rainbow, why, oh, why can't I? Who doesn't love the moment in The Wizard of Oz, when Dorothy wakes up from black-and-white Kansas to the colorful Munchkinland? I still love that movie. I remember my mom taking us to go see a play of The Wizard of Oz, and I insisted on wearing my own blue and white gingham dress for the occasion. I don't think I had the sparkly red shoes to go with it, but I still wondered if everyone would think that I was really Dorothy. I'm usually able to narrow my photos down a little better and not overwhelm a post with too many photos of the same thing, and yet, as I was editing my photos of this cake, each one prettier than the last, I just couldn't help but share more than usual. 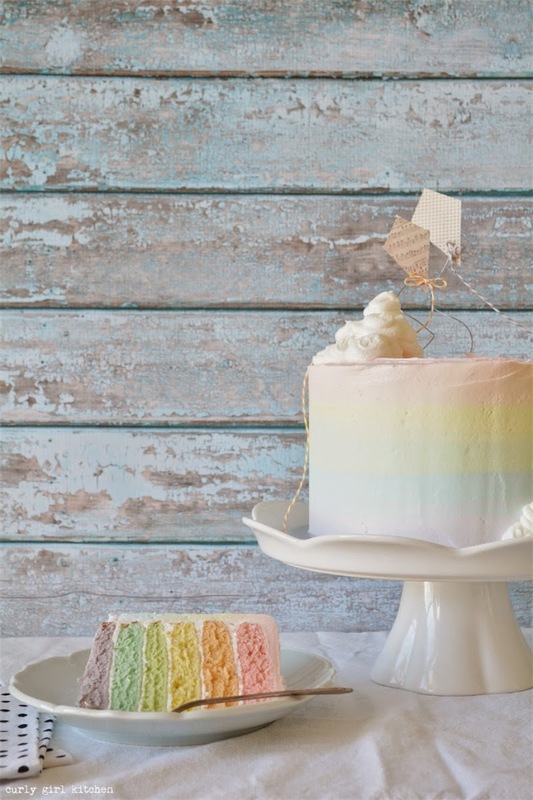 The buttercream stripes are one of my favorite techniques I've used over the past year. 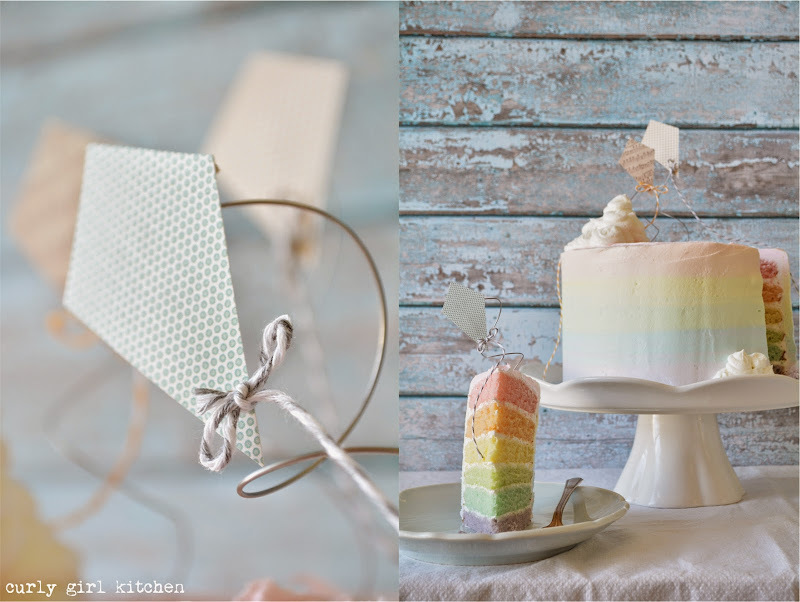 You can see other examples in my purple and white ombre Watercolor Striped Cake, my Neapolitan Cake, the colorful Little Birdie Cake, and my Stripes and Polkadots Strawberry Rhubarb Cake. I love stripes, and I can't get enough. 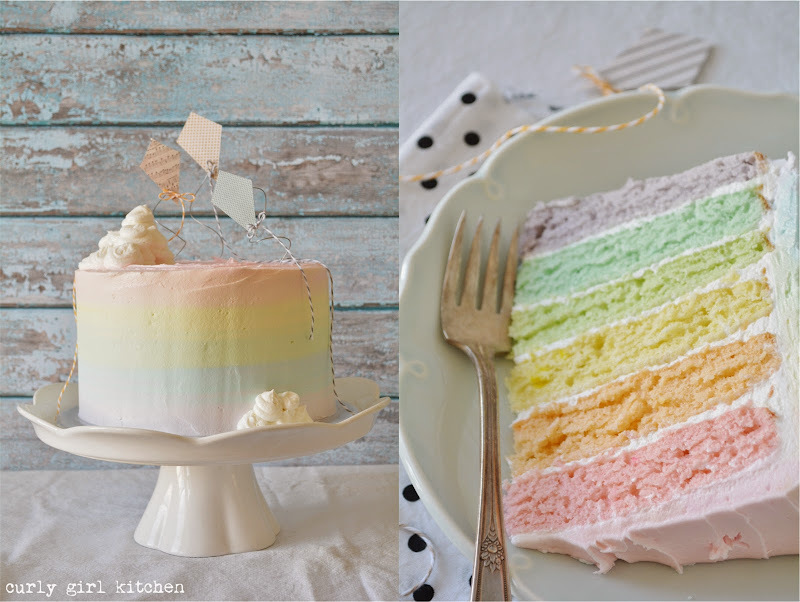 I kept the colors in this cake very pale, so they would blend together with a beautiful watercolor effect. I'm so in love with it. 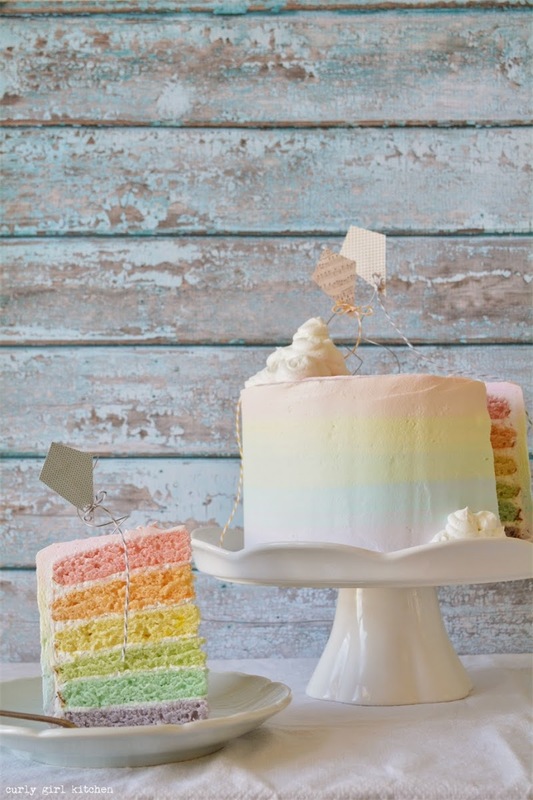 And the way the stripes in the buttercream parallel the stripes of the cake layers... it makes my heart skip a little beat. But let's talk about the flavor of the cake, too. The design was all I thought about until it came time to bake the cake, and when I saw a can of coconut milk in the pantry, I impulsively decided on a vanilla coconut milk cake. And it's fantastic. Moist and dense, creamy and subtly coconuty. As if the stripes and clouds and coconut milk aren't enough, it has paper kites, too. Paper kites! These were so fun and easy to make - just a little paper, toothpicks, hot glue, twine and wire. One of the most adorable cake toppers I think I've made. "It tastes like marshmallow clouds." 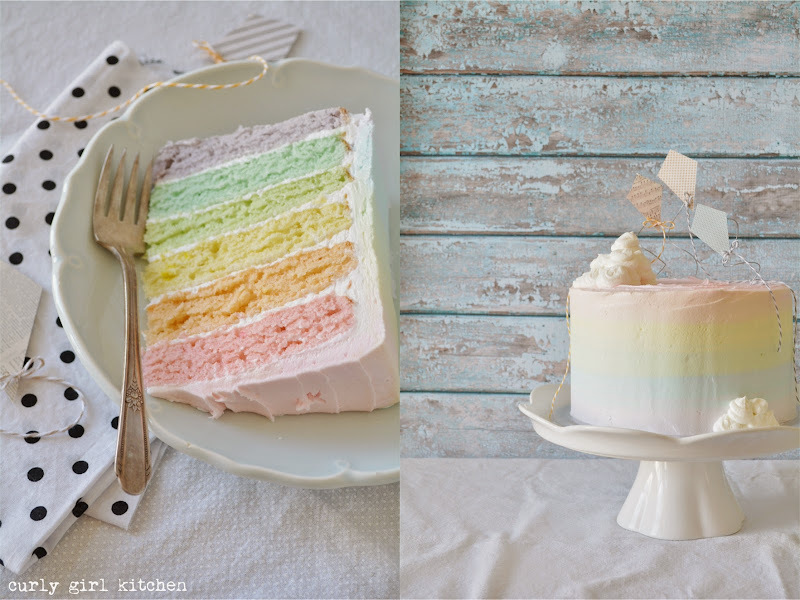 "This cake was kissed by angels." "Only a person with no soul would cut into the cloud on top". These things make my day. Now, let's go fly a kite together and chase a rainbow into Munchkinland. Even full fat (not "lite") cans of coconut milk can vary wildly in their cream content - some are almost solid coconut cream, while others are very watery with little cream. If you open yours and find that it's too watery, just use half, and supplement the rest with sour cream for a richer flavor in your cake. 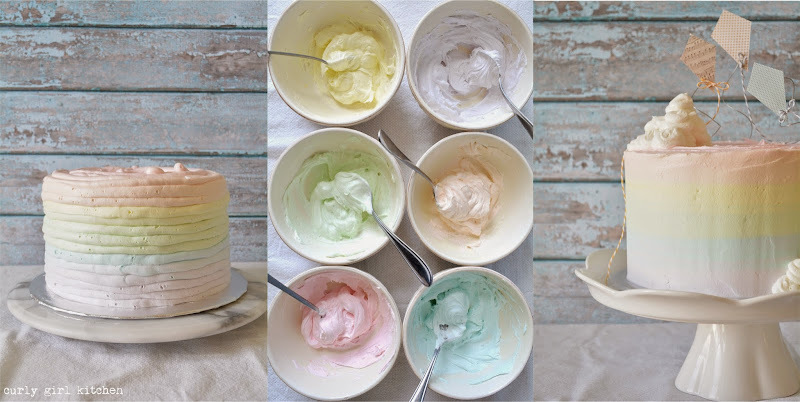 With the colors, I was aiming for very pale, pastel colors, and it doesn't take more than a drop of gel food coloring to achieve pastel colors in the cake batter, and maybe half a drop for the buttercream. Add the tiniest bit of color, mix it in, and then add a tiny bit more if needed. You can always add more color, but you can't take it out if you add too much. You need to decorate this cake on a turntable. It will be very difficult to smooth out the sides and blend the colors together cleanly without one. While I don't have a photo tutorial for making the kites, the steps are very simple. First, cut card stock into the shape of a kite. 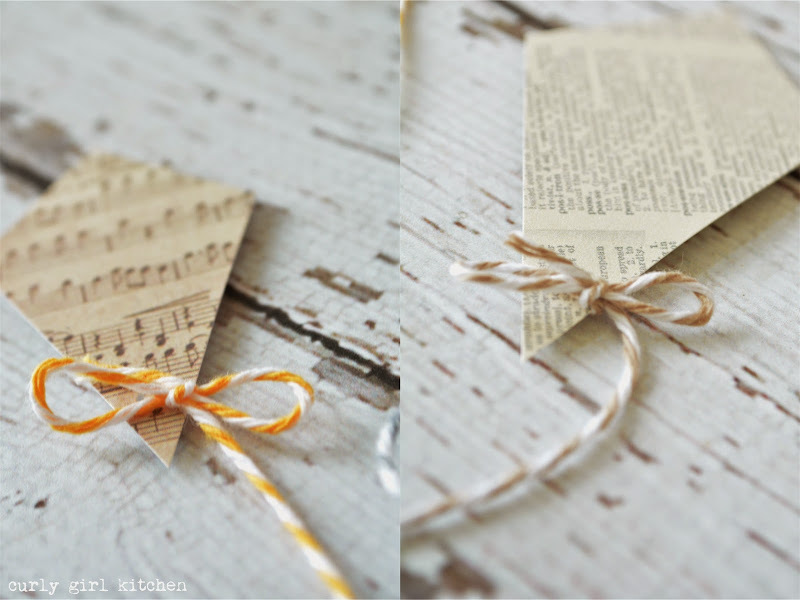 Use a small hole-punch to punch a hole at the bottom, and run a piece of twine through the hole, tying it in a bow. Then, use wire cutters to snip wooden toothpicks to the right length for the pieces on the back, and hot-glue them into place. 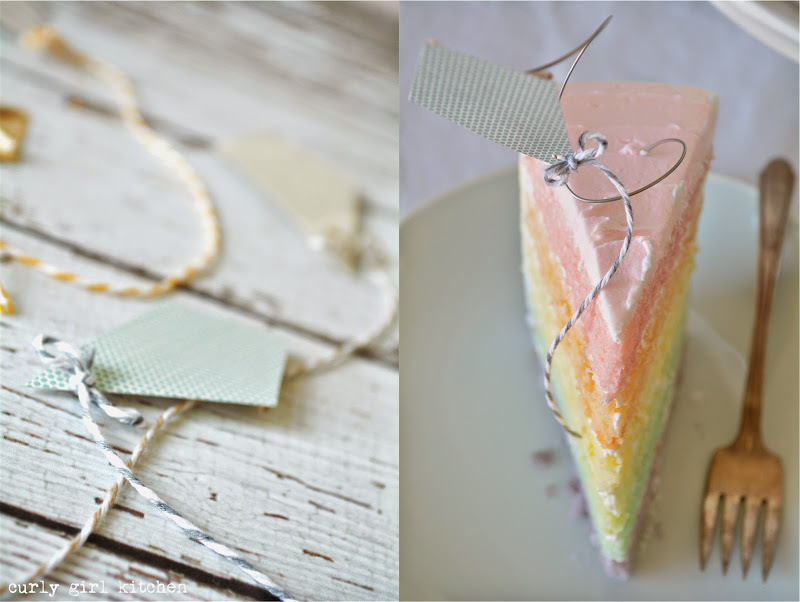 Finally, to give the illusion that they're flying over the cake, take a piece of wire and twist it into a loose spiral; hot-glue one end of the wire to the back of the kite, hold it in place until the glue hardens and stick the other end in the cake. Preheat the oven to 350 and grease six 8-inch pans, then line the bottoms with a circle of parchment paper. In the bowl of your stand mixer fitted with the paddle attachment, beat the cream cheese, sugar and butter on medium speed for 5 minutes, scraping the bowl occasionally. Beat in the eggs, one at a time, beating for a full minute before adding the next one. Beat in the vanilla and coconut extracts. In a separate bowl, combine the flour, salt, baking powder and baking soda. With the mixer on low, add the flour mixture in three additions, alternating with the coconut milk, starting and ending with the flour. Divide the batter equally into six bowls and tint with food coloring in rainbow colors. Pour into the pans, spread the batter out to evenly cover the bottom of the pans and bake for 14-16 minutes, until a toothpick comes out clean. Cool completely in the pans, on wire racks, covered loosely with clean kitchen towels. 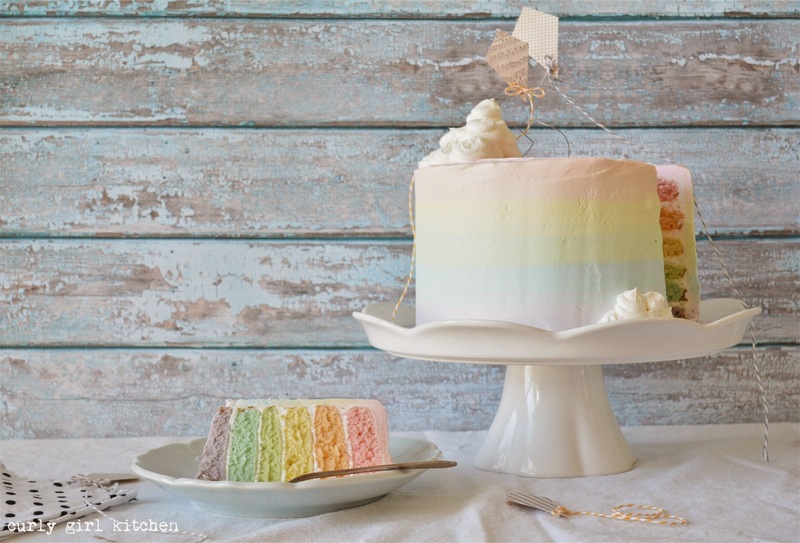 The beauty of this recipe is that the cakes will bake flat, moist and dense, perfect for stacking many layers with no need to level the cakes. In the bowl of your stand mixer fitted with the whisk attachment, beat the butter and shortening for 1 minute until smooth. With the mixer on low, stir in the powdered sugar and meringue powder until moistened. Add the vanilla extract and the cream/milk, then increase speed to medium high; whip for 4-5 minutes until very light and fluffy. Do not tint the buttercream yet. Place the purple cake on a cake board. Frost with a very thin coat of buttercream. 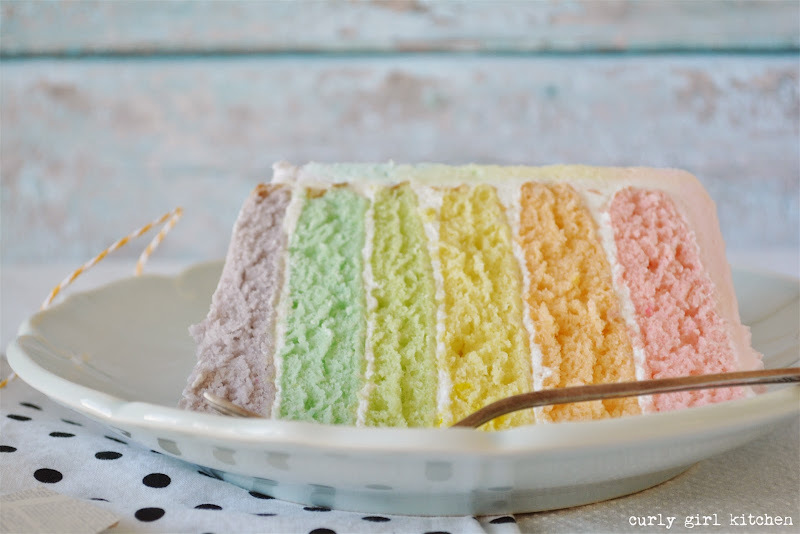 Repeat with the rest of the layers, from purple to blue, green, yellow, orange, up to the pink cake on top. Frost all over with a very thin crumb coat of buttercream. Refrigerate for 20-30 minutes. Meanwhile, set aside about 1/2 cup of the white, untinted buttercream - this is for the clouds. 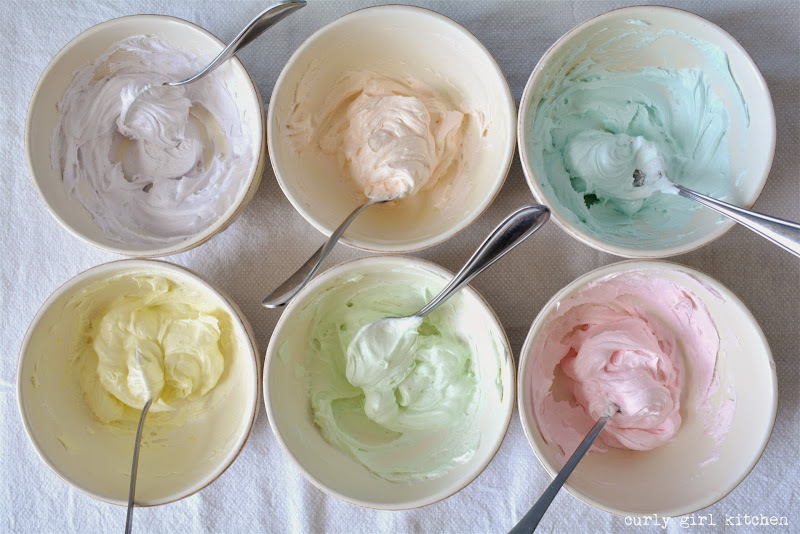 Divide the remaining buttercream into 6 bowls; the portions should be fairly equal, except for the pink, which should have a little more than the rest. Tint each portion with your food coloring, being extremely careful not to add too much color. Fit a piping bag with a round piping tip (I used Wilton #12). Scrape the purple buttercream into the bag, squeezing it all the way down to the bottom, then scrape the blue buttercream right on top of the purple. 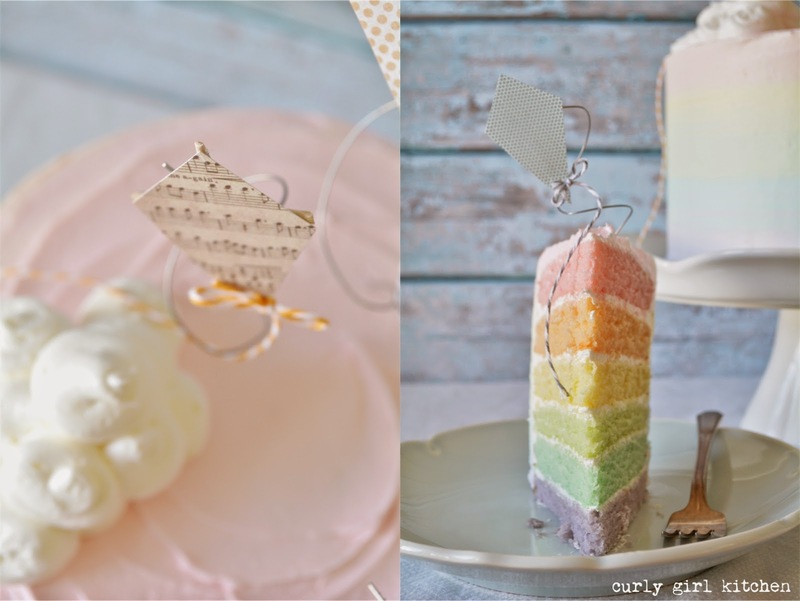 Take your chilled cake out of the fridge and set it on a decorating turntable. Starting at the bottom, pipe the buttercream in even rows (see photo above), all the way around the cake, making sure each row touches the next. As you pipe the buttercream, all of the purple will come out first for your bottom rows, then the blue will come out after to continue the watercolor rainbow effect. 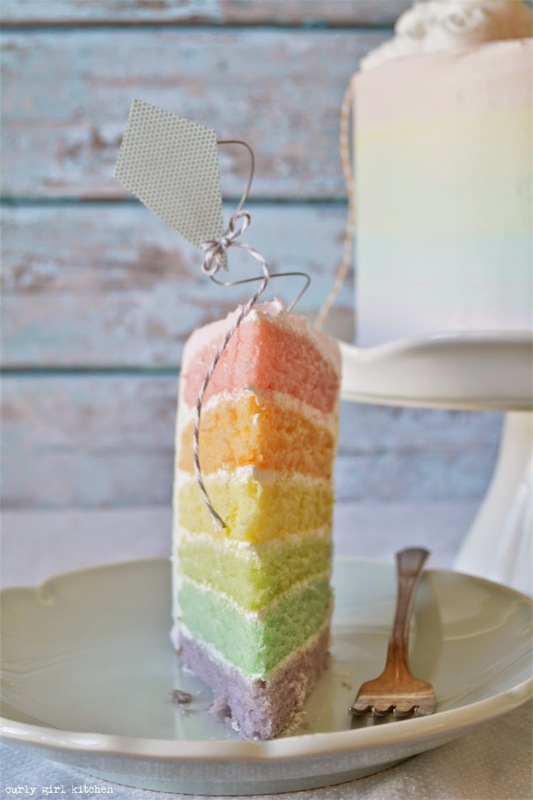 After you use up the purple and blue, use a clean bag for the green and yellow, then a third clean bag for the orange and pink, piping the pink on up to the top of the cake to cover the top. Now, take a bench scraper or pastry scraper, hold it at about a 45-degree angle to the cake and lightly sweep it around the sides of the cake on a continuous motion - this is where it is extremely beneficial to decorate your cake on a turntable so that you can turn it with one hand while you smooth the buttercream with the other. Without one, this step will be difficult for you. 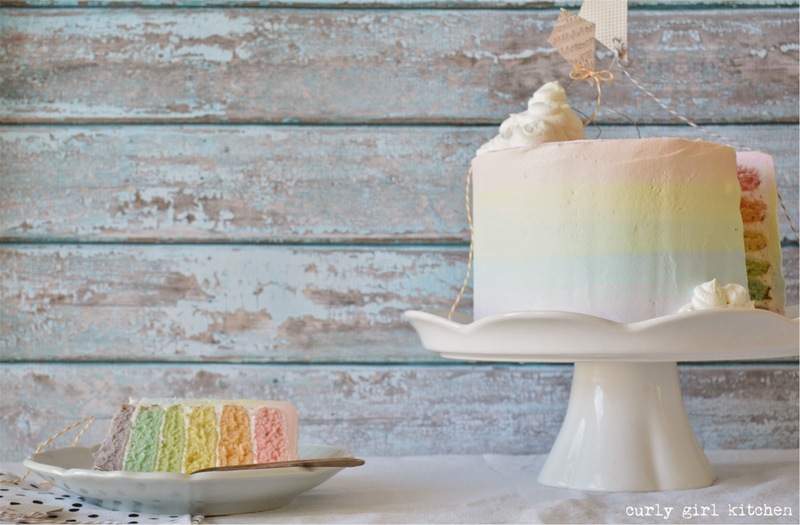 You are not trying to remove much frosting, so use a light hand - you are simply smoothing out any air bubbles and blending the colors together. Sweep around the cake several times, wiping the bench scraper clean with a paper towel each time around, until you're satisfied with the result. Smooth out the top. 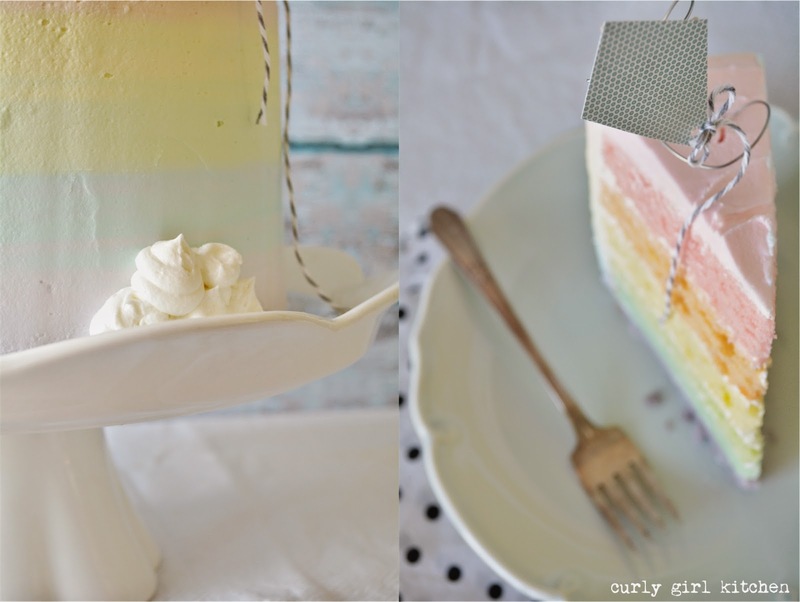 Use a clean piping bag to pipe the clouds onto the cake. 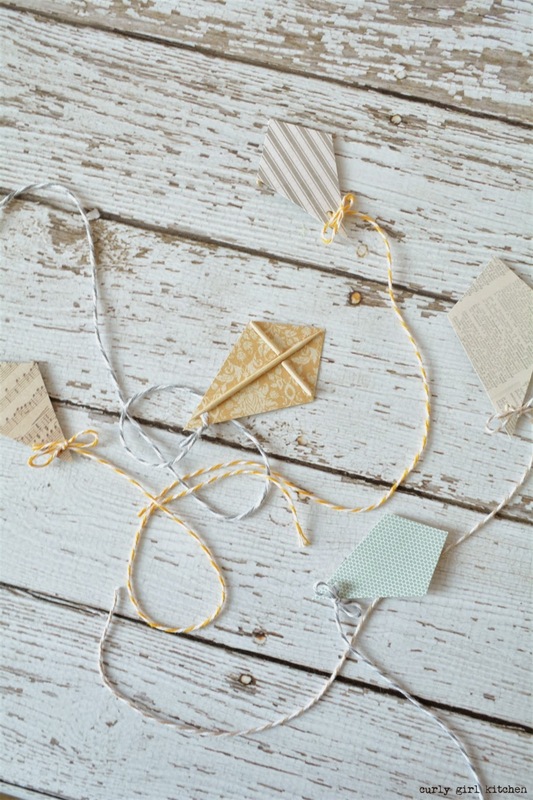 Top with paper kites for a fun, whimsical effect.